By Dan Ambrose: #8 WBA 147lb contender Errol Spence Jr. (17-0, 14 KOs) will be back in the ring on September 11th against an opponent still to be determined on the undercard of the fight between WBC light heavyweight champion Adonis Stevenson and Tommy Karpency on Premier Boxing Champions on Spike TV at the Ricoh Coliseum, in Toronto, Ontario. “Sept. 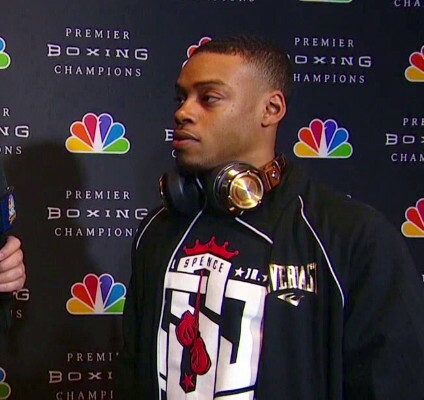 11 on Spike, Errol SpenceJr is slated for the co-feature. Opponent TBA. Stevenson-Karpency mismatch is the main event. #boxing,” Dan Rafael said on his Twitter. The Stevenson vs. Karpency fight isn’t anything to get excited about, as it’s a straight up mismatch, and even worse than Stevenson’s last mismatch against Dmitry Sukhotsky. But adding Spence to the card could make it an interesting card depending on how they match the talented 25-year-old against. Spence recently destroyed junior middleweight Phil Lo Greco in three rounds last June on the undercard of the Adrien Broner vs. Shawn Porter card at the MGM Grand in Las Vegas, Nevada. Lo Greco came in as a replacement opponent for Roberto Garcia, who had problems making weight. It would have been interesting to see how well Spence would have done against the hard hitting Garcia, who tends to be the stronger guy in many of his fights. Against Spence, Garcia likely would have met his match and would have needed to back off in order to survive. Floyd Mayweather Jr. was recently trying to lure WBA World welterweight champion Keith Thurman to fight Spence on his undercard on September 12th at the MGM Grand in Las Vegas, Nevada. But unfortunately, Thurman has shown zero interest in wanting to fight Spence. Thurman has a variety of reasons for not wanting to fight Spence, starting with the fact that he’s now yet a well-known fighter. Thurman also doesn’t like that Mayweather is setting him up to where he has to fight someone in order to get to him. Apparently, Thurman just wants the Mayweather fight straightaway without him having to work for it. This sense of entitlement is echoed by Amir Khan, who also feels that he doesn’t really need to beat anyone other than the guys he’s already beaten in order to get the Mayweather fight. Like Khan, Thurman has done a lot of trash talking about Mayweather, and like Khan, he’s being ignored by Mayweather. Mayweather really believes in Spence after having sparred with him not long ago and found out the hard way how tough he is and hard he hits. Mayweather now sees Spence as a future world champion, and that’s why he had been trying to get Thurman to fight him. Thurman thinks that Mayweather is hiding behind Spence, and using his as a pawn to try and see if he can take him out of the running. Spence wouldn’t get a shot at Mayweather if he beat Thurman. He would just get Mayweather’s title, which he would vacate for the purpose of the Spence-Thurman fight, and of course he’d get Thurman’s WBA “regular” welterweight title. Spence needs to be matched against the best fighter possible for his September 11th card. He needs a high quality scalp to add to his resume so that he can take away the arguments that guys like Thurman have about him not having beaten anybody. The more guys that Spence beats the less that fighters like Thurman can say about him. Spence would then put a lot of pressure on Thurman to finally face him so that he can take Thurman’s title and reduce him to a mere contender once again. Guys like Amir Khan and Shawn Porter haven’t shown any interested in facing Spence, so it’s not likely that either of them would be willing to face him on September 11th.